Art Spin Berlin 2017 – There won't be a tour this year? Here's why. We know that a lot of you have been wondering what is happening with Art Spin Berlin this summer and we apologize for the late communication. We’re sorry to share with you that there will be no Art Spin Berlin tour this summer. But don’t worry – we’ll be back next summer, and hope you will be, too! But why no tour this year?! Each year we struggle with the long and difficult process of getting permission from the city for all the wild and wonderful projects at our events as well as for the ride itself. We are using 2017 to develop a strategy for these efforts. Your donations toward our event are extremely valuable, but unfortunately not enough to cover all of Art Spin Berlin’s costs. So far we have been unsuccessful with our funding applications and couldn’t take the risk to run the tour without a budget. We’ve used the last few months to focus on new applications, which we hope will mean great things for 2018! While we love planning Art Spin Berlin tours, the organization takes up most of our time and energy from May to August. We decided to take this summer to focus on other projects – many of which will benefit the future of Art Spin Berlin. Art Spin Berlin founder Vanessa is taking this time to focus on her artistic practice, from a residency in The Netherlands last month to participating as an artist at Art Spin Toronto’s August 24th tour. 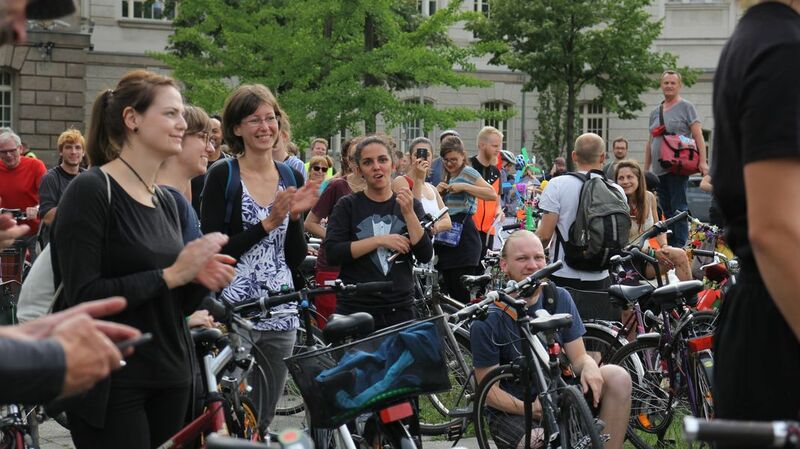 Our coordinator Flo has also become more involved in the Berlin bike scene, where there is political hope for better infrastructure and registration of cycling events in the city like Art Spin Berlin. We also have a few other events that we’re gearing up for, more details on that coming soon! It’s really hard for us to break this news, (which is maybe why it took so long), but we hope you understand our decision. We are looking forward to coming back in full force next summer, and will definitely make the wait worthwhile!